Homelessness In The U.S. Continues To Decline, Says H.U.D. Homelessness has been reduced 14 percent since 2010. The holiday season is in full swing, with many decking the halls with ornate decorations, filling their online shopping carts with gifts galore, and dressing to the nines for Christmas parties and other celebrations. On the other hand, the season serves another purpose — highlighting more serious issues, namely homelessness. 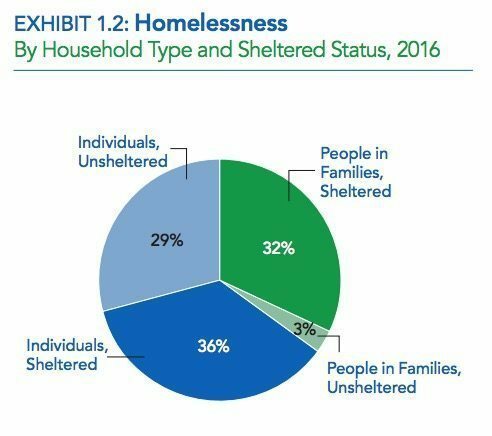 The U.S. Department of Housing and Urban Development recently released its 2016 Annual Homeless Assessment Report, which outlines the number of individuals and families living in emergency shelters, transitional housing programs and in unsheltered settings. The report is based on data from approximately 3,000 cities and counties across the U.S. The data is collected on a single night in January by “Continuums of Care” planning agencies and tens of thousands of volunteers who identify the demographics represented in emergency shelters, transitional housing programs and unsheltered settings, such as street corners. In addition to the data recorded on this night, HUD factors in full-year counts and data from other government departments. This year’s report revealed that homelessness among families with children, veterans and individuals with long-term disabling conditions has been reduced 14 percent since 2010. Furthermore, HUD reported a 23 percentage point decrease among homeless families, a 47 percentage point drop in veteran homelessness, and a 27 percentage point reduction in individuals experiencing chronic homelessness. 549,928 people were homeless, representing an overall 14 percent reduction from January 2010. Most homeless persons (373,571) were located in emergency shelters or transitional housing programs while 176,357 persons were unsheltered. The number of unaccompanied homeless youth and children appeared to decline in 2016 to 35,686, though HUD will launch a more robust effort to more accurately account for this important population in January of 2017. According to HUD Secretary Julián Castro, these improvements are due to President Obama’s “Opening Doors” initiative, “a joint action by 19 federal member agencies of the U.S. Interagency Council on Homelessness along with local and state partners in the public and private sectors,” to prevent and end homelessness. “Every person deserves a safe, stable place to call home,” said Castro.